Mission, missional, missio dei, transformation, incarnation, reconciliation – these are among the buzz words for current discourse about the church and its responsibility to the broader culture. Over the past few years I have found myself in numerous conversations about mission and what it means. These discussions have taken place in the context of my work in the arts and with artists. One thing is clear – understandings of what it is to be church are in flux and the meaning of missional quite uncertain. Things are a bit foggy at the moment. 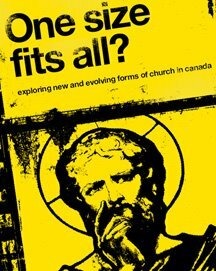 A recent documentary on this subject under the title OSFA?, (One Size Fits All www.onesizefitsall.ca ) takes a look at about a dozen examples of new configurations of church across Canada. I have seen the film and was recently part of a conversation about it at Toronto’s Freedomize community. It is evident that the arts play a predominant role in these communities – these “fresh expressions” as they are called in Great Britain. (www.freshexpressions.org.uk) As I write this I am attending Street Level – a gathering for those who work with the poor and marginalized on the streets of this country. You may or may not be surprised to hear that the arts are a permeating presence among many of the initiatives that are committed to diminishing the presence of poverty and homelessness in communities across the land. There is another place where the arts are now beginning to show up more than in the past. Traditional mission is not a context where one might expect to find a focus on the arts, but there are signs of change. Some may recall my involvement along with James Tughan and Phyllis Novak in shaping a document titled Redeeming the Arts back in 2004. That was the first foray into the subject of the arts at a Lausanne event. (www.lausanne.org ). Lausanne will hold its third international Congress in Cape Town South Africa in October 2010. There are plans underway for a pervasive arts presence at that event. On another front, just last November the Mission Commission of the World Evangelical Alliance (WEA) struck a task force on arts in mission. I have the privilege of direct involvement in both of these initiatives. These trends and these involvements are causing me to ponder how mission and the arts connect. I am well aware that the term mission and it practical outworking fall into the category of ‘politically incorrect’. Mission is seen as coercive, imperialistic, culturally insensitive and disrespectful of others. In short a moral failure. One cannot escape the threads of truth in these claims, but neither can one escape the clarion call of the Christian faith to affirm the universality of the good news and its missional character. essentially theological questions, questions with spiritual import? Art is certainly capable in bridging our differences and helping us to see what we as human beings hold in common. It has been typical of some who engage in the missional task to think of others in merely objective terms – and to consider souls not whole persons. Perhaps artistry can serve to bring us to attend to the whole person. The sensual nature of the arts makes it hard to ignore the bodily reality of who we are as image bearers of God. Moreover the arts serve as a reminder that we are creatures of sign and symbol embedded in culture with diverse means for understanding ourselves and our world. They speak to our need to move beyond prose and to step into the world of the poetic, of image, metaphor, drama, movement all ways of communication expressing more than we can say. Much could be said about the healing power of art, of its therapeutic value, or its connection with the spiritual and its capacity to deepen our understanding of the truth of things or to enrich our experience of liturgy and life. Granted these are preliminary thoughts on the connection between art and mission – I set them out here to signal my interest in generating conversation on these themes, and the desire to find new ways to talk about how these particular callings of art and mission might coalesce. Calvin Seerveld offers us a model in suggesting that just as the dove came to Noah “bearing fresh olive leaves” was a sign of hope and newness perhaps our aritistry can do likewise. For the record there was no e-magazine published in December 2008. We are glad to send out this first issue for 2009. As we all face the challenges of the economic downturn we are mindful of our dependence on the generosity of those in the Imago community across Canada. Your support is always appreciated and we hope you will be able to stand with us in the work of Imago in the months ahead.